Are you strategically using social media for your research agenda? While LinkedIn and other outlets might keep us connected, you might try a few social networking sites geared specifically for research connections. What is it? A portal that boasts more than 3 million “highly skilled scientists and researchers.” More than 137,000 social science researchers are a part of that. The home page has a nifty graphic where you can see the distribution of scientists on the site by discipline. How to sign in: Sign in with your Facebook credentials, or set up an account, to find the latest publications in your field, collaborate and discuss your work. The set-up is easy, with the system searching for your articles already online, and the screens guide you to select your discipline and areas of specialization. Then, you can select topics and colleagues to “follow” online. How it works: Once inside, it’s a robust social media platform akin to Facebook and LinkedIn. You can ask questions, upload data sets, seek feedback on articles, etc. An RG score is assessed for members, which counts their contributions to the system and acts as a reputation score. Something I found interesting was searching for your institutional colleagues and being able to see what they have been working on, even if you don’t encounter each other on campus very often. Note: Concerns about RG scores have been raised by researchers and others. 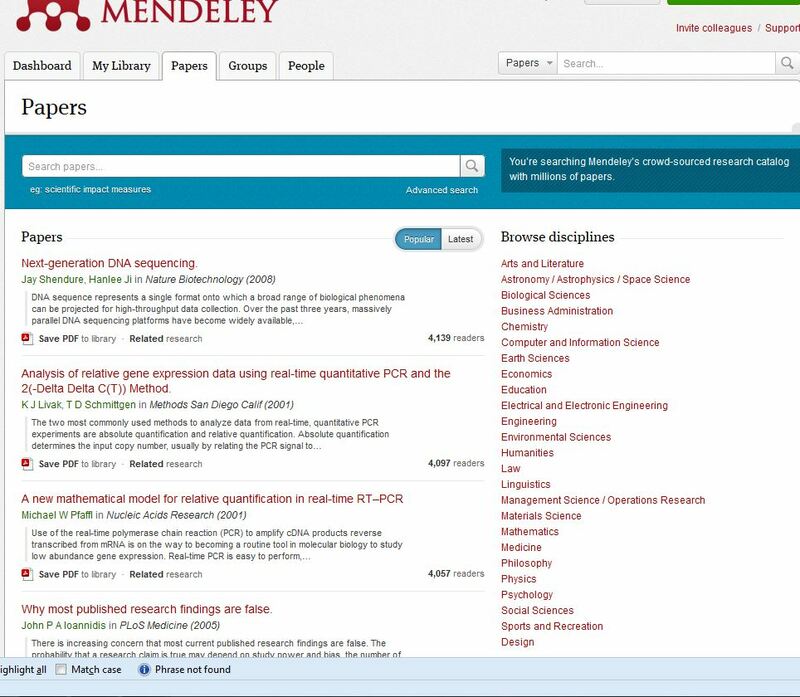 A screenshot of papers available within Mendeley. What is it? Mendeley, a free reference manager, also has a social networking component, in that it allows researchers to share their work with others. How to sign in: Create an individual Mendeley account or sign in using Facebook. Keep in mind that any service that lets you sign in via Facebook may also post automatic updates to your feed. How it works: You can create groups of researchers and share papers and citations. One cool feature is the annotation system; you can mark up articles and your colleagues will see your edits. You can follow curated bibliographies as well as better disseminate your own research, too. Mendeley also works with EndNote, Papers and Zotero. For best results you should install Mendeley on your desktop or laptop. Yes. There is an official Mendeley app on iOS, and Android has several 3rd party applications, such as Scholarley and Referey. What social networking sites are you trying for finding research articles or promoting your own research agenda? Which do you prefer? Dr. Sarah Maben is co-director of the Texas Social Media Research Institute and an editor for The Journal of Social Media in Society. She teaches journalism and public relations courses at Tarleton State University. Follow her on Twitter @SarahMaben.